The days may be shorter, but there are still apples to pick......not a lot more to come, but 'bits & pieces' - some second pick Braeburn + various 'odds & sods' - where hail has destroyed crops, the fruit is being picked for juice. Where hail damage has left a percentage free of damage growers are (where the facility is on site) putting the fruit through the pre-sizer and separating the undamaged apples from the residue which will go for juicing. 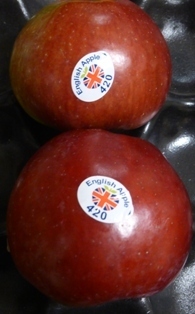 With increasing volumes of home grown apples on retail display, The English Apple Man visited the main Supermarkets to gauge the number and quality of UK grown apples & pears on display. 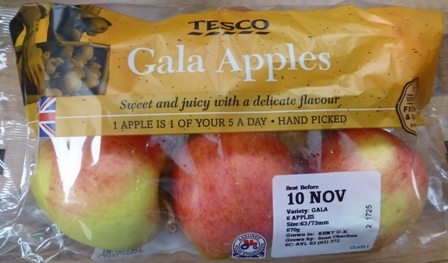 Gala dominates UK apple supply, with 'home grown' Braeburn quite not ready yet for eating; ZARI has been on display in Sainsburys (exclusive to Sainsbury) since early September, while Cox, our third most important apple (by volume) is an ever present throughout the winter months until early spring time. Early Windsor, Egremont Russet, Spartan are widely available, with emerging varieties; Smitten & Envy are available in Waitrose and M&S. 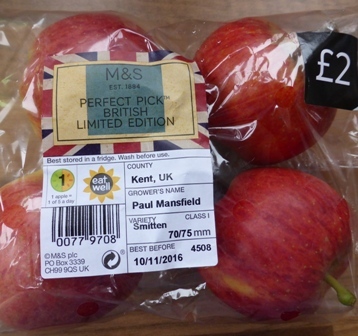 This week The English Apple Man visited several Supermarkets to see what 'home grown' apples and pears are available to consumers. My first visit; to a new Waitrose Supermarket in Hawkhurst (the village of my birth) - in my younger days the prospect of a Supermarket in Hawkhurst never arose, with local grocers and greengrocers meeting the needs of the community. Just a few years ago, the first Supermarket opened in the village - Budgens (which then became a Jempsons) followed by a Tesco on the site of what was the local 'bus station' in my childhood. During the summer (of 2016) Waitrose took over the site of the Budgens/Jempsons store and completely refurbished it into a fine new Waitrose Supermarket. With Tesco & Waitrose in the village, local shoppers have much more choice than in the past. Cox 'essentials' @ £1.50 - Mini Cox 'essentials' @ £1 - Winter Wonder 4 pack @ £2.50 - Gala, Ambrosia, Piroutte, & Red Windsor 4 packs (all) @ £2 - Polybag Gala x 7 apples @ £2 - Polybag 'Weather Blemished' Gala @ £1.50 x 7 apples - Polybag Egremont Russet @ £2.30 x 7 apples - Loose Bramley @ £1.90 kg - Conference Pears @ £1.50 x 6 pears. 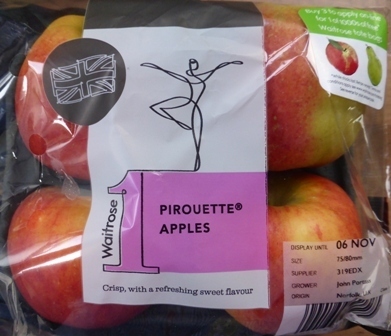 Waitrose can be relied upon to stock a variety of interesting varieties; Ambrosia, Piroutte, Orleans Reinette, Winter Wonder etc. 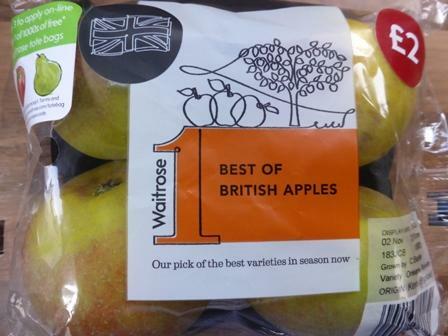 Bramley @ £1.75 kg - Gala @ £1.85 kg - 'Perfect Pick' Gala @ £2.25 x 4 apples - 'Perfect Pick' Cox @ £2.50 x 4 apples - Egremont Russet @ £2 x 4 apples - Envy @ £2 x 4 apples - Poly Cox @ £2 x 7 apples - Polybag 'Small gala ' @ £1.50 x 6 apples - Conference Pears 'Ripe & Ready' @ £2.80 x 4 pears - Polybag Conference @ £1.25 x 4 pears - Concorde pears @ £2 x 4 pears - Loose (Dutch) Conference @ £2.30 kg. Bramley @ £1.50 x 4 apples - Loose Bramley @ £1.94 kg - Polybag Rubens & Egremont Russet (both) @ £2 x 6 apples - Polybag Cox @ £1.50 x 6 apples - Polybag 'Small Cox' @ 89p x 6 - 'Orchard Select' Organic Blaze @ £2 x 4 apples - Smitten @ £2 x 4 apples - Santana @ £2 x 4 apples - Loose Gala @ £2 kg - Polybag Gala @ 75p x 6 apples - Bramley @ £1.60 kg - Comice Pears @ £1.50 x 4 pears - Conference Pears @ £1.29 x 6 pears. A couple of years ago, The English Apple Man was disappointed by the visual display of apples & pears - over the last two seasons this has been redressed (at my store in Hastings) and the whole top fruit display unit is very good. 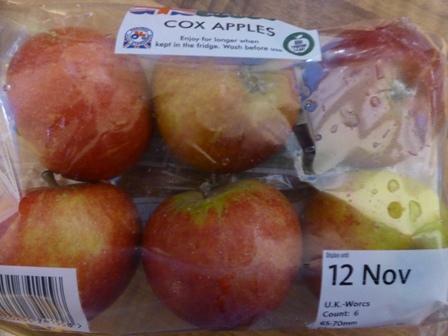 Cox & Gala (both) @ £1 x 6 apples - 'Small & Sweet Kids Gala' @ £1.14 x 8 apples - Loose Bramley @ £1.73 kg - Bramley @ £1.60 x 4 apples - Loose Gala @ £2 kg - Large loose Spartan @ £ kg. 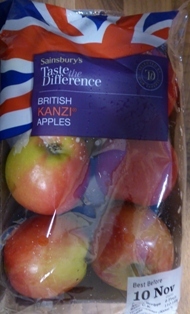 Imported Pink Lady @ £3.37 kg - Granny Smith & Golden Delicious (both) @ £2 kg - Polybag Golden Delicious @ £ 1.60 x 6 apples - New Zealand Jazz @ £2 x 6 apples - Braeburn @ £2 kg - Granny Smith @ £1.60 x 6 apples. 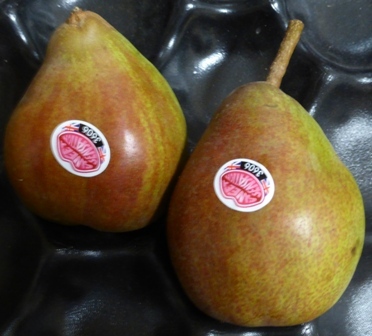 Conference Pears @ £1.25 x 4 pears - 'Ripe & Ready' Conference Pears @ £1.75 x 4 pears - Concorde @ £2.25 x 4 pears - Sweet Sensation pears @ £2 kg - Loose Comice pears @ £2 kg - Early Windsor apples @ 80p x 7 apples - 'Greengrocer' Gala @ 80p x 6 apples - 'Greengrocer' Conference pears @ 80p x 6 pears - 'Family Bag' Gala @ £1.75 x 12 apples - Bramley @ £1.50 x 6 apples - Loose Bramley @ £1.75 kg - Zari @ £1.10 x 5 apples - New Zealand Jazz @ £1.90 x 6 apples - Loose Jazz @ £2.50 kg - Early Windsor @ £1.10 x 5 apples - Cox @ £1.10 x 6 apples - Loose Cox @ £1.85 kg - 'Taste the Difference' Kanzi @ £2.25 x 6 apples - Loose Gala @ £1.85 kg - Polybag Gala @ £1.10 x 6 - Gala 'flow wrap @ £1.50 x 4 apples. Sainsburys commitment to home grown apples is confirmed by the 34 trays of English apples & pears on display from a total of 64 trays. All the apples and pears eat very well; "one would expect that to be the case this early in the season when the fruit has 'plenty of life" - Smitten, Pirouette and Kanzi were especially tasty!